Our system of integrated farming is designed to utilize every inch of land. Not only should the surface land be fully utilized, but the space under the surface, and even the space above the surface, should be used to the maximum. The surface, the sub- surface and the space above the surface is to be used 100%. There are three main systems of cropping which will ensure the maximum utilization of land – mixed cropping, supplementary cropping and crop rotation. In mixed cropping two or more crops are grown in a field at the same time. For example, potato, spices, brinjal, pumpkin and cauliflower are suitable for mixed cropping. Mixed cropping reduces soil erosion and the wastage of agricultural land, and makes better use of water. It also helps retain the fertility of the soil. For instance, legumes add nitrogen to the soil whereas maize consumes nitrogen, so these crops should be planted together. Well selected plant combinations maintain the fertility and structure of the soil. In supplementary cropping there is one main crop and a minor crop to support it. This system is different from mixed cropping where all crops are major. In crop rotation the soil is under cultivation for most of the year. In the Purulia district of West Bengal, many farmers grow only one crop of paddy a year. Through crop rotation four crops can be harvested in a year. In the rainy season no mixed crop can be grown with paddy, only small fish. Autumn paddy can be combined with big onions, summer paddy with radish, and spring paddy with small onions grown from seeds. Cultivation should be done on the cooperative basis. Only cooperatives can support the expanding economic requirements of agriculture, like creating ponds, purchasing machinery, uniting local people to pressurise the government for irrigation facilities, etc. Through the cooperative system four crops of rice in a year can easily be grown from any plot of land. To ensure the maximum utilization of every inch of land, there is also a system of planting in the boundary areas of all schools, farms, orchards, homes, etc., as well as beside all roads. For example, trees with spreading branches, like most fruit trees and even some timber trees, should be planted all around the perimeter of such places at fixed distances. Palm trees, which grow straight up, should be planted in between the fruit trees, as they do not block the sun light from the fruit trees. Between the fruit trees and the palm trees, filler plants should be planted. Three examples of small filler plants are edible anthurium, a root crop; permanent cotton, a shrub; and arrowroot, a root crop. If the soil is deep and good, plant anthurium. If the soil is stony and poor, plant permanent cotton. 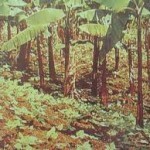 If the soil is of medium quality, then plant arrowroot. In between all these there is still space for associate plants to the filler plants. With anthurium plant Chinese mini-grape; with permanent cotton plant ghee kavla, a vegetable; and with arrowroot plant wild mini bitter gourd. The boundary wall should also be topped with wire, then it is also quite possible to plant wire plants, in series, as in the lakeside plantations. Where trees are planted around the boundary of agricultural land, care should be taken so that they do not shade the crops from the sun. So a well integrated system of the blending of crops has many benefits. There is the maximum utilization of land because the space below the surface, on the surface and above the surface is fully used. Properly selected crop combinations also increase productivity, and regions which produce only one or two paddy crops in a year can harvest four paddy crops as well as other associated crops in a year. Through scientific crop rotation which does not adversely affect the productivity of the soil, maximum crops can be planted in the minimum period of time, and maximum crops can be planted in the minimum space. The space around buildings and fields can be used to grow boundary plants, and any convenient space can also be used to grow fill-up and fill-gap plants. Poor farmers will be benefited if they adopt such a system, and so will society. Amongst all the types of culture of the physical stratum, agriculture is the best. We must encourage and develop agriculture. If you want to help someone, you should help him or her a little at first, not all at once. You should help a person in accordance with his or her needs, not too much, not totally helping – otherwise he or she will not try for his or her own development. You help a person a little, then let him or her stand on his or her own, and he or she will automatically take up activities in his or her own spirit and with his or her own ideas.